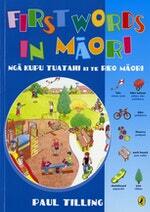 An engaging illustrated book introducing children to a vocabulary of everyday words and concepts in te reo Maori. All scenes are labelled in both Maori and English. Children can easily learn everyday words in te reo Maori with this essential picture book for whanau, preschools, schools and libraries. Lively and colourful, My First Words in Maori is a welcome and friendly introduction to a fascinating language. Designed to appeal to a wide age range, this book contains bright and amusing pictures and provides a wealth of vocabulary-building opportunities for learners of Maori. Common scenes such as In the Park, In the Classroom, On the Marae, At the Construction Site, plus more extend the reader's use of common Maori words. Extra lists of numbers, colours, shapes and parts of the body are found at the end of the book. Love First Words in Maori? Subscribe to Read More to find out about similar books.